Dan Krant joined LifeLine as an EMT in 2015. While he began his EMS career with an inquisitive outlook and an interest in the medical field, he always believed he would end up in law enforcement. Over the course of the last few years, Dan discovered that EMS is his passion. Because of this, he has grown as a provider and leader within our company and industry. 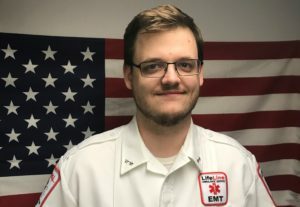 Dan is an enthusiastic and passionate Field Training Officer, and greatly enjoys helping hone our new EMTs into the best providers they can be. He welcomes the challenges faced when training and leading his peers. Additionally, his commitment to quality patient care has resulted in his selection as one of LifeLine’s Base Managers. While many would shy away from difficult or challenging patient interactions, Dan finds joy in problem-solving. He likes when he can successfully calm patients, put someone’s mind at ease, or otherwise positively impact outcomes. Dan maintains singular focus on his patients, and how can he serve them the best as a provider. He also simply enjoys meeting all different types of people. Dan also understands the value of work-life balance, and encourages others to enjoy life outside of EMS. He uses his personal time to explore the outdoors by camping and hiking. Dan Krant perfectly embodies the characteristics of a Star of Life because he works diligently to help his patients, peers, friends, and family. Dan is ever-willing to take on more responsibility to benefit others. For these reasons, Lifeline is proud to call Dan a 2018 Star.